The week before Christmas we packed the tents and headed off to Abel Tasman, at the northern tip of the South Island of New Zealand, for a week in the sun. 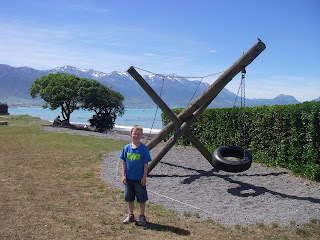 We piled the boys in the cars and headed north stopping in Kaikoura for lunch. Now Finlay doesn't travel light. There are a few extras we need to pack for him. Quite a few. What with his insulin pump, feeding pump, infusion sites, feeding sets, insulin, daytime digestive enzymes, night-time digestive enzymes, gastrostomy tube, glucose meter, test strips, spare test strips, alcohol wipes, glucagon, spare glucagon, syringes (various), plasters, antibiotic cream, spare cartridges, meter batteries, pump batteries, pump power cord, spare gastrostomy tube, lancets, back-up gastrostomy button, bottles, mixing pots, hypogels, spare hypogels, back-up hypogels, emergency back-up hypogels...it's a wonder we ever manage to leave the house. So perhaps we shouldn't have been too surprised to get to lunch and discover we hadn't brought any of his milk! For a diabetic child with a highly regimented feeding plan requiring a high-carb prescription-only milk formula five times a day to delicately balance his blood sugars between damaging highs and potentially lethal, seizure-inducing lows this was possibly the worst thing, other than Finlay himself, that we could have left behind. So we hastily booked a campsite in Kaikoura, and while Vicky, her sister and the boys enjoyed the delights of the spa pool, I bought the most sickly, sugary milk drink I could find, made sure I had plenty of hypogels (just as well we packed the emergency back-up ones!) and turned the car around heading back for Christchurch. 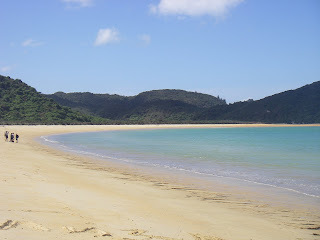 What should have been a lovely spot for lunch! But it was worth it in the end! !